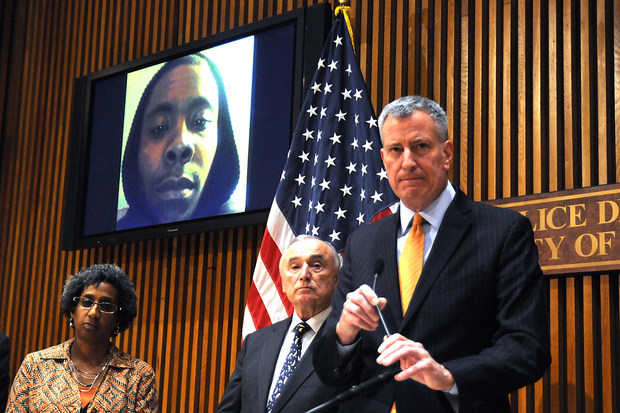 Mayor Bill de Blasio and Police Commissioner Bill Bratton displayed an image of accused Staten Island homeless shelter stabber Michael Sykes during a press conference at One Police Plaza Wednesday, Feb. 10, 2016. CIVIC CENTER — Mayor Bill de Blasio said the city would immediately close a Staten Island hotel shelter where a man fatally stabbed his girlfriend and two of her daughters Wednesday morning and offer free security to 41 others. The incident was the latest in a string of fatal stabbings in city shelters this year, including that of a former special education teacher who was killed in an East Harlem facility by a roommate with a history of mental illness. The Ramada Inn at 535 Gannon Ave. had overnight security, but no one to police the shelter during the day when the attack happened, officials said. The hotel is one of four in Staten Island being used as a shelter, and the remaining three would be reviewed by the city. In the meantime, the NYPD would start to offer security to the shelters free of charge starting Thursday. “I’ll remind you that hotels are private property, so the hotel management has to make a decision to accept security on their property,” de Blasio said. The city has also struggled with its recent $22 million program, NYC Safe, which aims to help violent mentally ill residents. In one instance, a woman who was repeatedly arrested in Harlem for threatening to kill neighborhood children was never enrolled in the program. There was no history of domestic abuse in the Staten Island stabbing, according to officials, and the boyfriend, Michael Sykes, 25, had not been treated for mental illness. De Blasio said the attack affected him on a personal level.